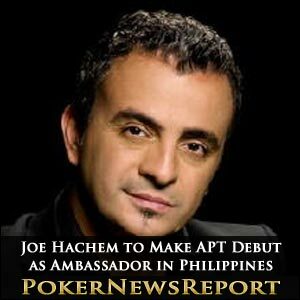 Joe Hachem is to make his Asian Poker Tour (APT) debut as a tour ambassador in the Philippines next month when the series pulls into Pasay City’s Resorts World Manila venue for seven days of action. The former Team PokerStars Pro will line up alongside hundreds of other hopefuls for the $2,700 buy-in main event that kicks off on April 21 for a five-day tournament that will include two Day 1 streams. However, the APT series of events in the south-east Asian nation actually runs from April 19 to 25, with the $550 buy-in Heads-Up Asian Championship starting proceedings at 13:00 local time on day one. The presence of Lebanon-born Australian Hachem – the 2005 World Series of Poker (WSOP) main event champion – should attract even bigger numbers than the 231 players who signed up for last year’s APT Philippines main event that was won by Filipino Enrique del Prado for $179,260 after he defeated Elton Tsang in their heads-up clash. Certainly, as one of the world’s best known pros, Hachem – who was announced as an official ambassador for the biggest and most celebrated independent Asian poker tour in January after he entered into a deal with tour owners and online casino operator AsianLogic Group – “is the perfect player to represent the APT”, according to the tour’s tournament manager Jason Morris. The 46-year-old Melbourne pro is Australia’s most successful player with more than $11.5 million pocketed from live tournament earnings – and Morris added that the APT are looking “forward to having him join the action at APT Philippines”. Morris continued by suggesting that “the players themselves will also be glad” to have the opportunity to “test themselves against an opponent who already has well over $11 million in tournament earnings”, while event organisers will definitely hope to see entry numbers increase due to the added attraction of having Hachem begin the latest stage of his career in the Philippines. Thereafter, there is the APT Asian Series Goa event in India, which will be held in Casino Royale from May 21 to 27, while the final leg arrives with the APT Macau from July 25 to 31 at the StarWorld Hotel & Casino.